There are so many potential disasters that could happen at any moment, and you want to do your best to be prepared for all of them. 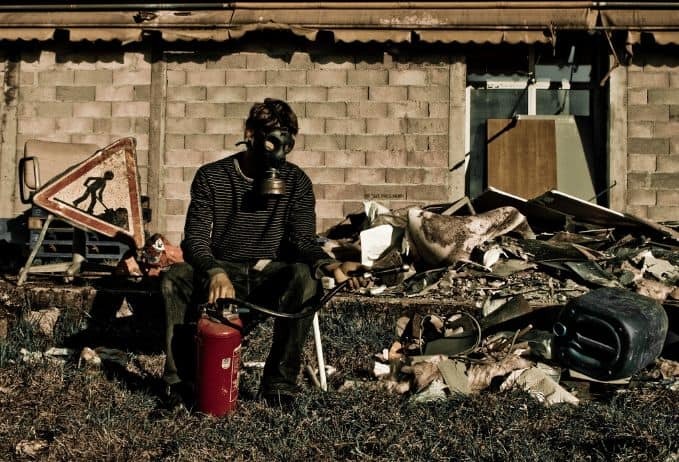 This list of prepper supplies and gear isn’t meant to cover every single item that you would want to have in these situations (I’m sure blacksmithing equipment would be nice to have but I’m not including that on the list!). 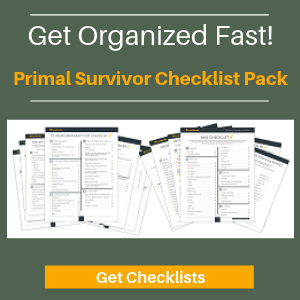 Rather, this preppers supplies and gear list is meant to cover all of the items that a normal person would need in order to survive virtually any disaster. Since there are multiple items which can perform the same task (such as matches and a flint both being able to start fires), I’ve divided up the items into categories by the survival task that they perform. Water purification system: This may include a camping water filter, bleach, or water purification tablets. Read more here. Survival shelter: I highly recommend that you learn how to make a quick survival shelter for wilderness situations. This can be done using debris like branches. To be prepared, you will want to make sure your Bug Out Bag (BOB) contains a tarp for creating a temporary shelter, and/or a tent. Sleeping bag: Get a good, lightweight sleeping bag that is rated for freezing temperatures. 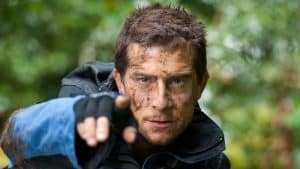 Clothing: In survival situations, you don’t really need more than one change of clothing (in case the clothes you are wearing get wet or for when you clean them). Anything more is just going to weigh you down. Footwear: You will want good waterproof steel-toe hiking boots and also lots of changes of socks. You can wear the same clothes for weeks but sweaty, crusty socks will give you uncomfortable blisters! Raingear: A rain jacket can also double as a tarp for making a shelter or collecting rain water. Fire starter: Don’t rely on a lighter. It will fail you! Get matches or a match-less fire starter. There are two types of disaster situations that you will need to prepare for: bugging out and hunkering down. Bugging Out refers to situations where you’d flee to the wilderness to wait out the worst. For bugging out situations, you should have about 2-3 days worth of food. Hunkering down is for situations when you would need to stay in your home (such as after a nuclear disaster when you don’t have enough time to get out of the danger zone). For hunkering down situations, you should prep your home so it has at least 1 month’s worth of nonperishable food reserves. Preferablyl you’ll want even more! Non-Perishable Food: For bugging out, choose light foods like freeze dried meals and dehydrated foods. For hunkering down, choose any non-perishable foods like canned goods and bags of rice and beans. They will have to be rotated and/or packed properly for long-term storage. Cooking Stove: A small camping stove is good. Some options are gas or alcohol stoves. Camping Pot: This can also serve other functions, like if you need to boil water for sanitizing tools for applying first aid. Dishes and Utensils: These aren’t really a survival necessity because you could all eat from the camping pot and fashion chopsticks out of sticks or even pencils. But you’ll be happy to have a camping plate and utensils on hand. 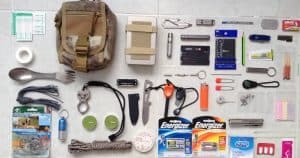 You will probably want to make several first aid kits to have ready, such as one inside your Bug Out Bag and another in your home, and yet another in your car. This is important so don’t skimp! Make sure everything is in a quality waterproof bag. See this First Aid Supplies Checklist! Cash: Keep a stockpile in your home, not in the bank. ATMs aren’t going to work after EMP. Again, many of these items aren’t absolutely necessary for survival. At the very least, you should have flashlights because they can be used for multiple situations, and will allow you to flee in the dark without risking a broken ankle. Solar charger: For your batteries and other powered devices! In a disaster situation, you really don’t need much in terms of hygiene items. Still, these hygiene prepper supplies can help you avoid rashes, diseases, and discomforts. Bucket + Plastic Bags: For hunkering down situations, this is what you will be using as a latrine in your home. Make sure you’ve got enough plastic bags!!! This part of the list could go on forever. I mean, how are you supposed to keep your family safe against a mob, or when vandals come to rob your home? 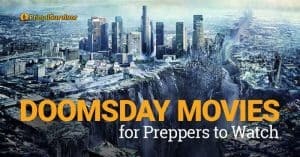 I’ve listed the most basic prepper supplies and tools that will be needed to keep you all safe in a variety of disaster situations. Door security: Bolts, EZ Armor, etc. Weapon: And the knowledge of how to use it! Feel free to expand here based on where you live, your family unit, and comfort level. You can never be too prepared! Tool set: hammer, screwdriver, wrench, nails, screws, etc. How many of these items do you already have? Is there anything which should be added to the list? Let me know in the comments or join the discussion in our Facebook community! Check out our Ebook bundle. 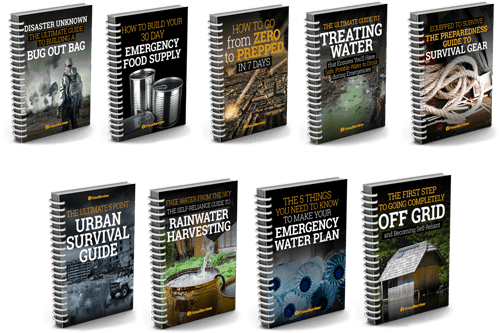 Nine titles packed full of premium prepper information. Instant download - print off for use when the grid goes down. I’m Jacob Hunter, founder of Primal Survivor. I believe in empowering people with the knowledge to prepare and survive in the modern world. Survive The End of Days Review: Legit or Scam? I’ve read conflicting views…..if you have a solar lantern with an LED light source, will that bulb still be viable after an EMP? If it has a lithium battery? If it is battery operated, but the batteries aren’t installed, I assume it will still work. 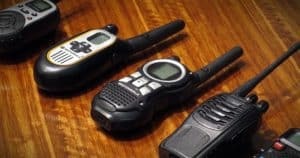 Also looking at emergency radios… Any insight would be appreciated!